My studio windows were installed yesterday! And what a difference they make! I’m hoping to have siding up this week, but so far I’ve had a bit of a problem nailing down an exact day that they can start. And I still have to build the portico before they can install siding on the side of the studio anyway, so that will be my goal today (officially my first project since taking time off for my pinched nerve issue in my neck, back, shoulder and arm…I think I’m finally up to it). I dug through my old pictures to see if I could find a “before” picture of the garage from this angle, and unfortunately, I failed to take one. That’s disappointing, but I did manage to find two pictures from different angles that still give a very good idea of where this started. Obviously this is the front of the garage taken from the other side, and this was taken during the early stages of the breakfast room remodel, so I have a pile of contractor bags full of debris stacked up on the left, and a pile of the old shiplap from the breakfast room walls stacked up on the right. But sadly, it’s the best “before” picture I have of the garage/studio. That door went into the storage room at the back of the garage, and directly straight ahead was the huge furnace. The window to the right of the door, and the other window hidden behind the big oak tree, were the windows at the back of what is now the pantry. Here’s another view. 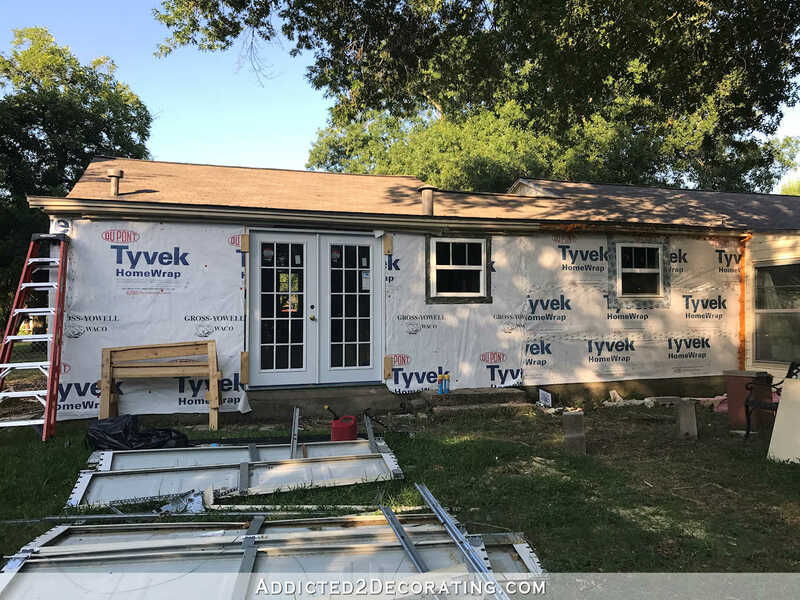 This is the picture I took right before my brother and I tore down the siding on the back in order to remove those windows and rebuild the back pantry wall. The French doors are obviously the ones that go into the mudroom at the back of the studio. The window just to the right of that is the window in the half bathroom at the back of the studio. And the window to the right of that is the pantry window. That wall butts into the side of the sunroom, which will eventually be torn down for our big family room, laundry room, master bedroom addition. I eventually want to change up the roof line above the French doors. I envision a gable roof that extends out to cover a patio and walkway to the carport. And that’s where I’m rethinking my plans. 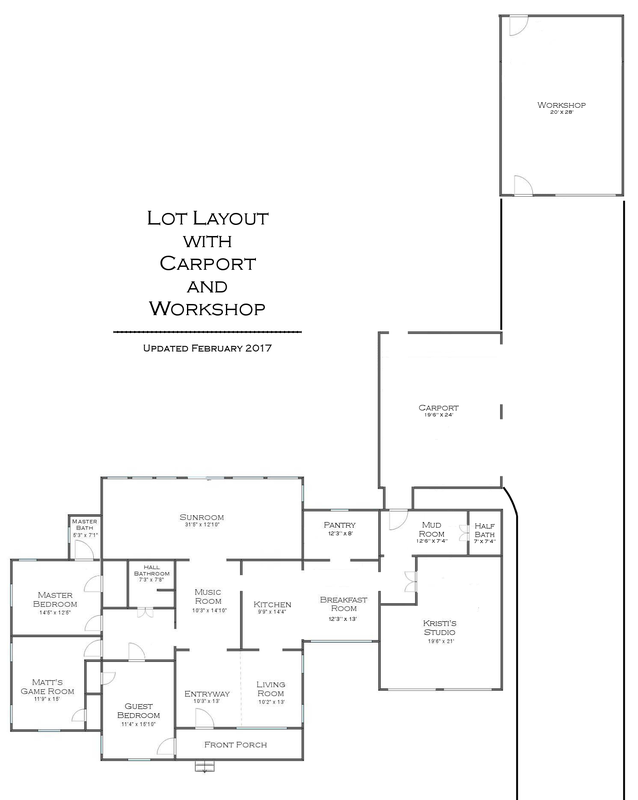 I had originally planned for the carport to be directly behind the studio/mudroom like I showed in this “long term plan” floor plan a while back. (Obviously I flipped the mudroom and half bath locations in my final decision). But now that the French doors are installed, I think the view out of the doors is too pretty to cover up with a carport. Okay, granted, it’s not much to look at right now. 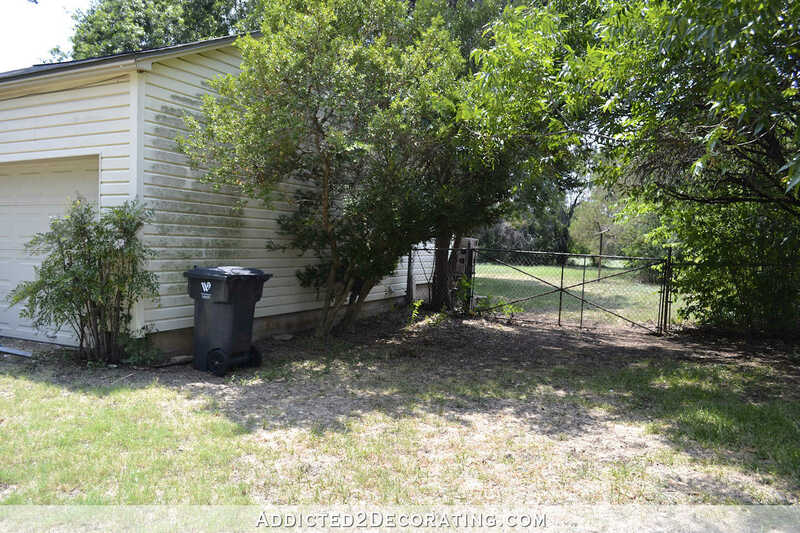 But once I find a place to store the garage doors (that I’ll reuse on my workshop in the future), and we actually do some landscaping in the back, I think it’ll be too pretty to hide. That way overgrown hedgerow that you see cuts our back yard about in half, so I’d like to get rid of it completely so that the view goes all the way to the back of our property (it’s a 1-acre lot, so it’s pretty big for being in the city). And overall, I have really big plans for the back yard that I think will be beautiful and interesting to look at when it’s finished. It would be nice to be able to see it out the back doors of the studio. So that means that I’ll have to rethink this idea that I had for the configuration of the driveway, carport, and my workshop. I’m really not quite sure how else to configure it since the carport should be wide enough for two cars, and there are only so many feet between the side of the studio and the property line. And the workshop needs to be close by and also close to the paved driveway for easy drop off of MDF, plywood, and other large supplies. But interestingly, the very first time I saw this house, I remember being so disappointed at the lack of a paved driveway. In fact, that was almost a deal breaker for me. In hindsight, that was one of the best things about this house. If the house had a paved driveway going to the front of the garage, this whole garage conversion would look just like a garage conversion when it’s all said and done since driveways are the single biggest giveaway that a garage has been converted into living space. But since my house has no paved driveway, I can have it poured exactly where I want it and then landscape in front of the studio any way I want. 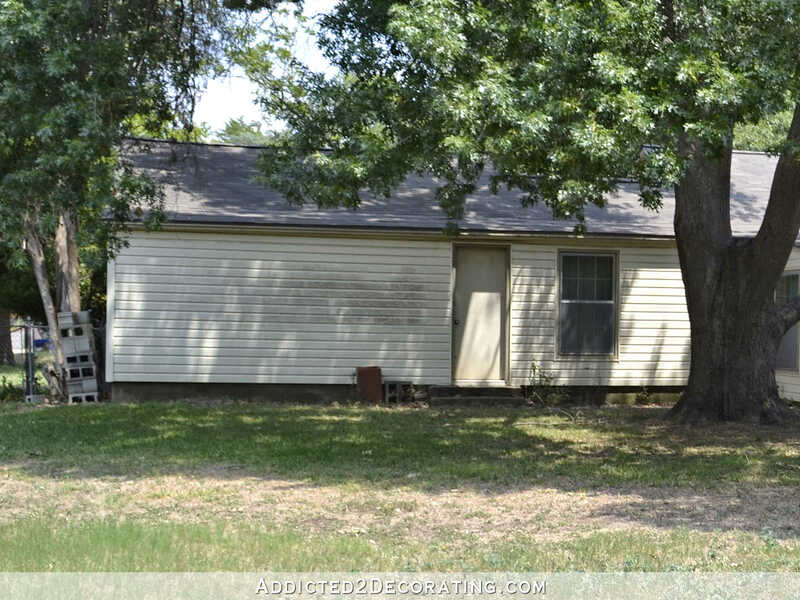 So if you’re looking for a fixer upper, just keep that in mind. 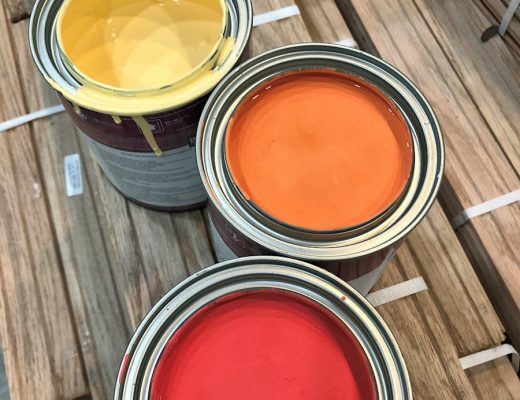 Those things that may seem like deal breakers on your initial viewing of the house may very well end up being bonuses as you plan and figure out exactly what changes you want to make to the house. why couldn’t you put a drive-thru carport next to your studio and still keep the workshop as is? No need to put up the portico! There isn’t enough room for a two-car carport on the side of the house. Cathy’s idea is the same as mine. You could extend the carport wider than the workshop. The second (left hand) car might have a slight jog to make but the length of your drive would allow for that. You’d need a longer walkway overhang, maybe. Another option would be two car ports. One drive through close to the house and a second on the left side of the workshop. Cute! I remember similar steps during some of our renovations. Amazing how those cinder blocks can be so handy. Supports to make block/lumber bookshelves in my younger days or filling them to make a flower bed/border. You brought back some memories for me. Early Renaissance style lol, we’ve had a few of those over the years too, just lovely workmanship there. Do I remember that you’re on a corner lot by any chance? If so you could change the driveway to the other side of the lot. I’m guessing you’re not since that seems too obvious. If not, would you consider putting the carport and workshop next to each other (like to the left of the workshop)? Would that be too far from the house? We’re not on a corner lot. I’m not sure if the workshop and carport can go next to each other. I need to get some of that bright neon spray paint that they use to mark utility lines on the ground and mark off the carport and workshop next to each other and see if that will work. Have you measured how long and wife the driveway will be. You have a small fortune in concrete for the “airstrip” We have built a couple custom homes and the driveways are expensive. Can you live without a covered walkway to the house from the carport? If so I’d just put the carport in front of the work shop. I’m in the same boat. I want covered, but I want covered all the way including walls as well. Especially the way it rains here in TX. I may have missed it, but can you explain the difference in how you are using “studio”, “office” and “workshop”. For instance, I know that this is your studio. How do you plan to use it that is different than your planned use for a workshop? You’ve got so much lovely space and I’m trying to imagine how you plan to use it. It will be quite the change from moving your workspace each room changes. Once my studio is finished, I won’t have a separate office. My “office” will be one corner of the studio, and that’s where I’ll have my computer, printer, etc. I’ll use that corner for editing my photos for my blog, writing my blog, paying bills, and doing other general officey stuff that people generally use offices for. The studio is for projects that are everything but woodworking projects. So this is where I’ll have my big workroom table that will accommodate full drapery panels. I’ll use the room for sewing, upholstery, art projects, etc. Basically all of those projects that don’t require saws, sanding, and spray painting. Kristi, I was going to ask a similar question but about spray painting. 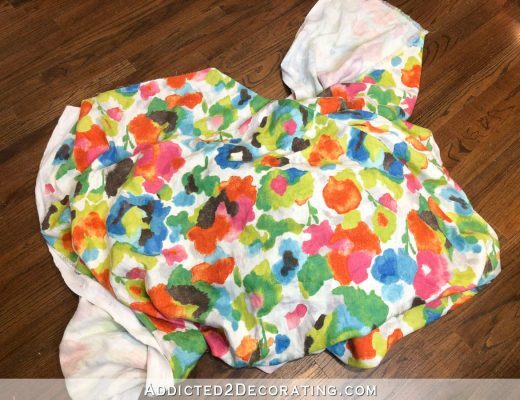 How do you (or how are you planning to) separate the spray-paint area from the woodworking area, so that there is no dust that could go on the freshly painted surfaces? A partition wall? Hanging some plastic sheets from the ceiling? A special boot? For spray paint area… I saw an great example of a good set-up in the workshop the RougeEngineer bloggers use. They hung extra long dropcloths on a track system. When in use they are pulled out and can create a room, or just cover a minimal area. There is extra length puddled so less escaping off-spray and flexibility. When done they just push the dropcloth curtain to one side. You can get an inexpensive rail system VIDGA at IKEA. A dedicated spray booth would be great. Maybe there’s a way to make one with movable/adjustable walls? If there is, Kristi will think of how to do it! Maybe an attractive carport in front of the studio? That’s what I was thinking, too! I’m not great at figuring out things like this, but really if you can’t put it on the side, then I think putting it right in front of your workshop is the only plan. And as you said, you want access to drop things off so you need it near the workshop and the workshop cannot go on the other side, correct? But I have a view at our house and until we had a view I didn’t appreciate how nice it is so I’m all for you having something pleasing to look at from your studio. Have you considered a tandem carport in front of the workshop, to the left of the pictured current plans? 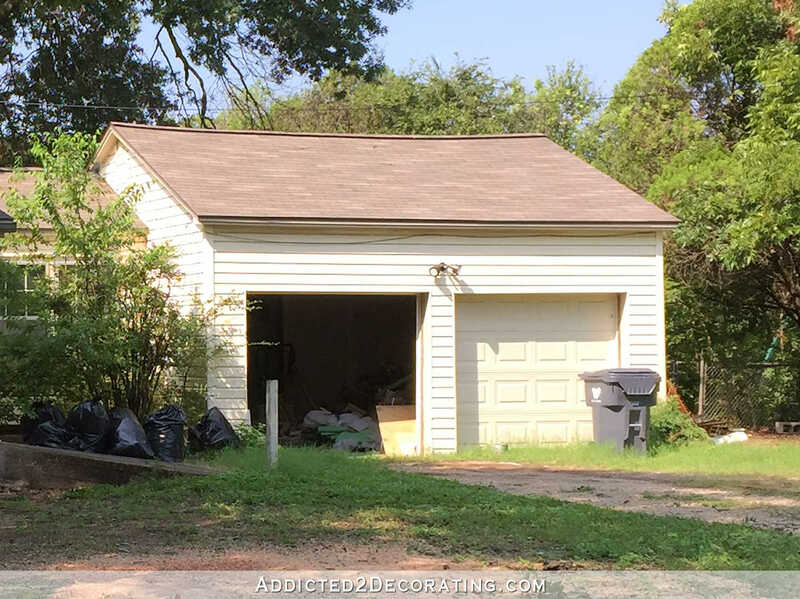 Perhaps the current driveway in front of the proposed workshop could be widened by a foot or three, as well, so the garage door to the workshop would not be blocked by any vehicle parked under the carport. I’ve seen tandem garages, and while they are not the most convenient option, it still allows for covered parking for two vehicles. The present plan’s space for the covered carport could still be paved, to be used as a turn-around, allowing you to still enjoy the view, while giving the option of NOT having to back up down the entire driveway–not my favorite thing, especially with a vehicle filled to the brim with things obstructing the view! Plus, the paved turn-around would offer extra parking if, and when, needed, for guests, family, etc. Boy, all in all, you are going to be pouring a LOT of concrete! Tandem parking sounds workable in theory, but I’m here to tell you it’s a logistical **nightmare** in real life! I’m in west Los Angeles where space is at a premium, and we have tandem parking at my home, and here at my office. I could fill pages and pages of your blog recounting incidents that happened due to tandem parking – lost keys, parking partner at lunch so you can’t move your car, etc. It may be easier for you since you will be the owner of both cars and have keys to move them, but **invariably** you will almost always need the car parked in front, and have to play musical chairs to get them moved around. I wouldn’t trade traditional, side-by-side parking for anything! My thoughts exactly! I think the view seems too important now because you have no other place to enjoy your lovely property. With the family room done you’ll have plenty of time to soak up the view there. Also, I think when you stand at the French doors the view is fabulous. But you won’t be standing in the mudroom gazing out a lot, will you? You’ll be in the studio focusing on your project. And one more thing…carport to me is something with a roof and open sides…which wouldn’t impede the view completely. 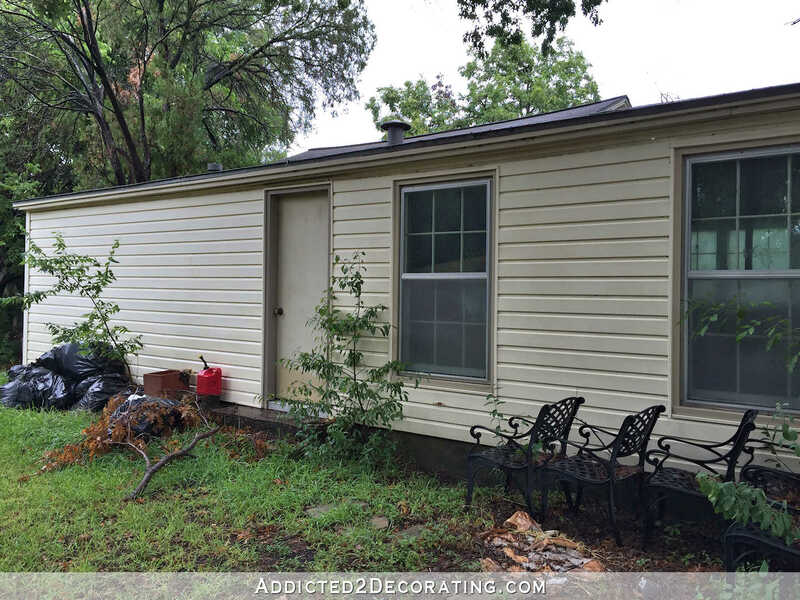 Is a carport TX basically a garage without doors? Jen W., your last statement is what I thought. A carport is relatively open, so you could still see the view if both cars are not there. But a long carport along side the studio could work. Make it so that it can be driven through, with a covered area behind the studio to access the house for Matt. Continue the drive all the way to the workshop, and maybe have a drive-on type patio out there that could serve as a turnaround or a patio. It may also be a nice place to work when it’s nice outside! Kathy, that was what I was just thinking. 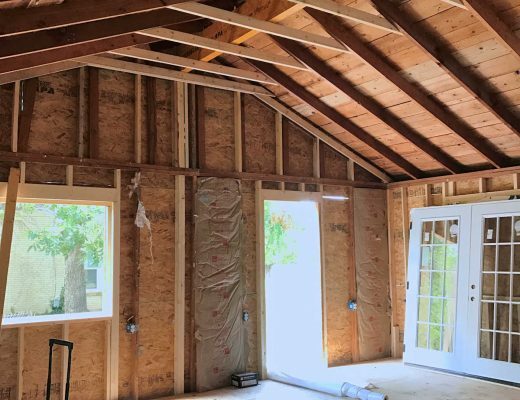 The carport will be nice to look at as you had initially envisioned Kristi and the real show stopper will be the view of the expansive yard from the family room. Is it a possibility to set the carport back a little further, outside the pantry, to still capture some of the light and view too? that is my thought too and 2 other things in the picture you are standing in the mudroom so the view would be different and you will be working most of the time in there. How often do you access both cars? I know you do a fair bit of daily running around to and from the hardware store, but if it’s typically just you and the truck in and out each day (right, you got a truck?) maybe you should do a full 2 car carport in front of the workshop, and then a mini one-car covered area next to the studio. That way, as you are coming and going you have a close to the house covered place to park with an entrance to the house (and maybe those someday clients will appreciate the cover too), but at the end of the day when you’re done running around you can choose to pull into the full covered carport in the back. It seems like you might want the cover connected to the workshop (for unloading lumber in bad weather) and the cars tucked further back on the property. All the new windows, the side door and the French doors make such a difference! It is looking so good, even without siding! The new portico over the side door is going to be the icing on the cake, so to speak! As for your carport, hmm, tough decision, as I’m for keeping any views. Possibly the carport could be in front of the workshop? I’m not sure where you’d put the carport, but if you do move it, I’d still have an area just outside the french doors that is big enough to be a small patio/single parking spot on an as needed basis. I’m envisioning pavers with a nice wooden ramp to get up the step. You could add large planters to define it a little more as primarily patio than parking spot for your view most of the time. Think of how handy it’ll be to park and unload anything bulky without having to schlep it across the property. (Or maybe this is what the door on the side of the studio is for? But a ramp there feels like it might be awkward.) And if you do start having outside clients again, they could park right there next to the studio and walk right in. I like it the way you planned originally…keep the car port where it is. Picture some hanging flower baskets and other deco items to make it a lovely view – you really won’t be in the mudroom for the purpose of looking out at the view. Make the show stopper the view from sunroom and bedroom area. Love what you are doing so far!!! It will be amazing!! Okay my two cents, for what that’s worth! LOL! 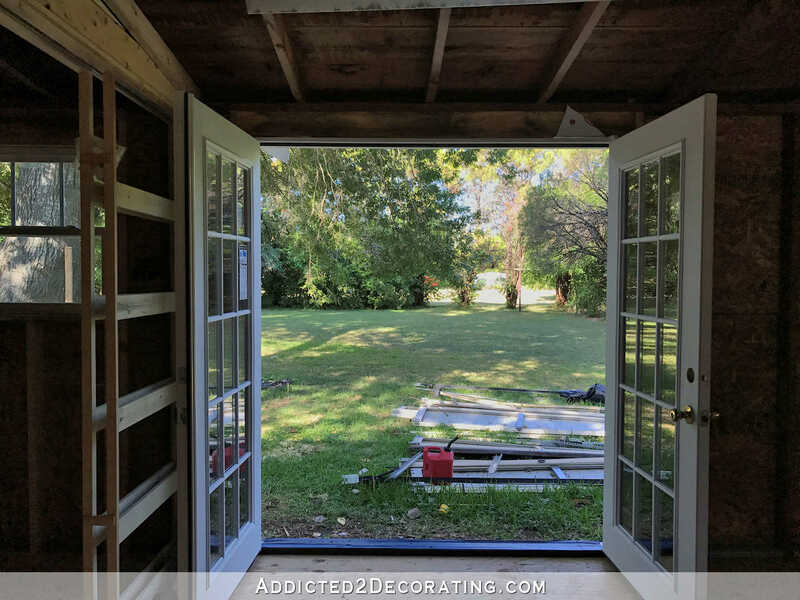 I’m going to suggest you move your carport farther out from your back doors, and put in a small stone patio in front of your french doors, between the house and carport and half walls on your carport in what ever style you like. Then your view is still excellent, and your bigger backyard view will be from your family room. I think you will love it almost as much, as it would be obstucted with cute/styled/useful space! It does not have to be a large area, just a small cozy one. Best of both, when you can sit out side with coffee and watch the birds! I know what ever you do will work for you both and can’t wait to know what! LOL! Ditto!😀 You’re rethinking this because the view “is new”. You won’t be positioned in your studio to sit and gaze out the French doors. Think about it…. your back is to it at your work counter, you’re a little tucked in the corner at your desk and you’ll be busy when at the work table. The function of your original plan is really too perfect for you. Pushing it back and joining it to the house with a longer covered walkway with a small patio would be lovely. I imagine friends and family will be using the back entrance the most , make it welcoming. Yes, the back french doors were planned primarily as a way for Matt and family to get into the house under a covering when the weather is nasty. So it still needs to be serving that purpose somehow. The exterior looks great already. If I didn’t know that this was a garage just a few weeks ago, I would never look at it and think that it had been one. 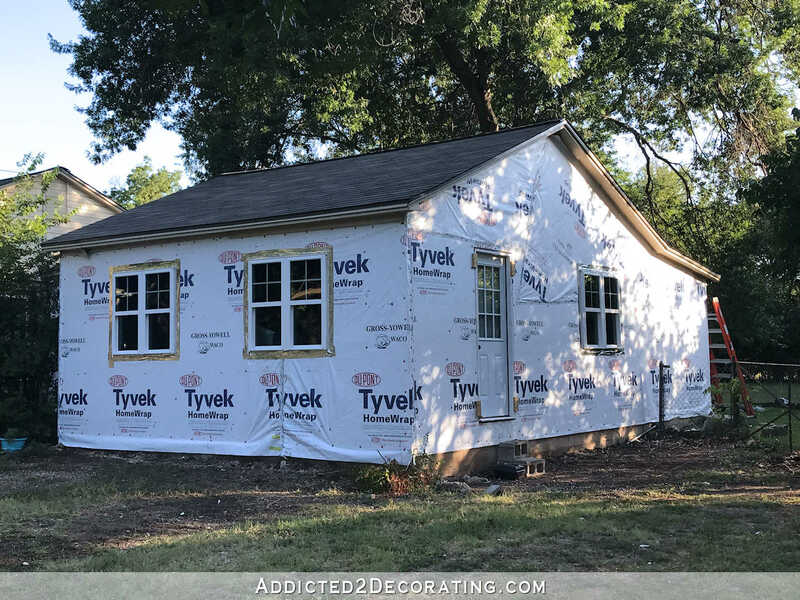 I can’t wait to see it with the siding! Have you checked with your city to verify how many feet you have to be within your property line? In our state and county, there is a minimum that can’t be breached. 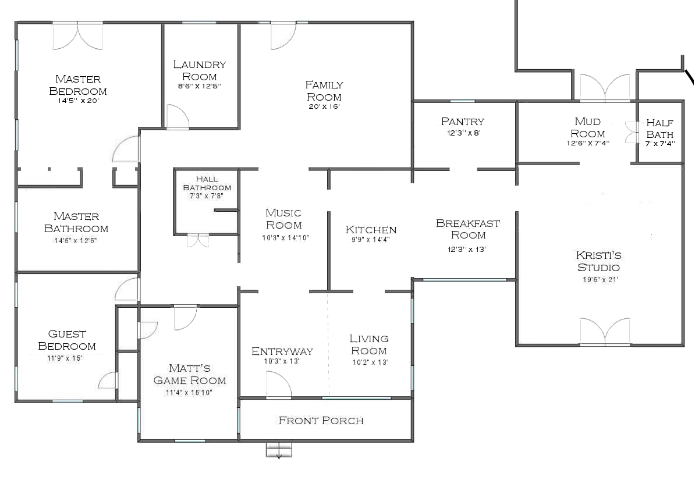 Additionally, would it make more sense to move the powder room to the pantry wall, and you could put a second side door that would allow for a car port to just run next to the garage versus side and back? I would definitely not put the carport in front of the new studio as I guess that will be the view you will enjoy the most while your working there – gazing out that side while sitting at your lovely long table with sewing projects rather than standing at the mud room door looking back :). And it does look so much as part of the house now rather than a garage (well done with chosing that window arrangement!!) that it would be a pity to take that back by putting the cars in front of it! Cannot wait for the look (and perhaps tutorial??) of your portico!! I *think* you are confusing studio with workshop. The workshop is a separate building in the backyard. Take a look at the plans for a better understanding. But a carport in front of the studio–i.e. in the front yard–would be a terrible idea! I am on Team Leave-the Carport-Where-It-Is. Put a lovely patio outside the addition. And until that is done, just move the vehicles and put out a table and chairs and enjoy your covered patio. If that is still not floating your boat, it might not hurt to call in a consultant. A good landscape designer might have an excellent solution for you. I don’t see you spending much time looking out the french doors when you are in the studio working on your fun projects! I think you should leave the plans as you originally designed. Kristi… I haven’t read the other comments… so this may have been a thought offered. But… when I think of a carport I think of a covered parking area with no back… just sides (or not). Could you make an attractive carport on your driveway that you could drive through to reach your workshop? I once was driving through a neighborhood that had very nice houses but very small lots. One we actually stopped to look at because I was so enthralled by how they did their garages. They only had a one car wide driveway running along the right side of their house and as you went down that side of the house, there were garages set diagonally into the house. I think they even had three of them but since they were build diagonally, they didn’t take up as much space left to right. I hope you can understand what I’m trying to explain. I thought it was really unique and definitely made it possible for them to have a much wider house. A single carport where you planned a double carport; if it’s pretty it can also serve as a covered patio. Then put another single carport in front of the workshop. You’re not blocking any cars in and you get a bonus patio when needed. I just want to say that your studio/office/workshop is coming along so quickly! I can’t wait to see the end product! I don’t know which direction the back of the house faces, but maybe the portico would actually block some of the hot Texas sun from those french doors. You would still have a beautiful view when the cars aren’t parked there. It looks like it might be hard to make that quick left into the first bay of the carport once you’re past the studio and backing out on a tight turn would be difficult for me. Hope it works for you.